Interest in reportage keeps growing, and this book is a great primer on the subject – from the opening which defines and explores the development of visual journalism to later chapters advising those aiming to try this form of investigation themselves. From rock gigs to demonstrations, via Syria and Thailand, the featured illustrators capture life and many of its complexities. Those who are reading out of general interest will be encouraged by the exercises to consider taking up one of the recommended forms of mark making and tackle a project of their own. 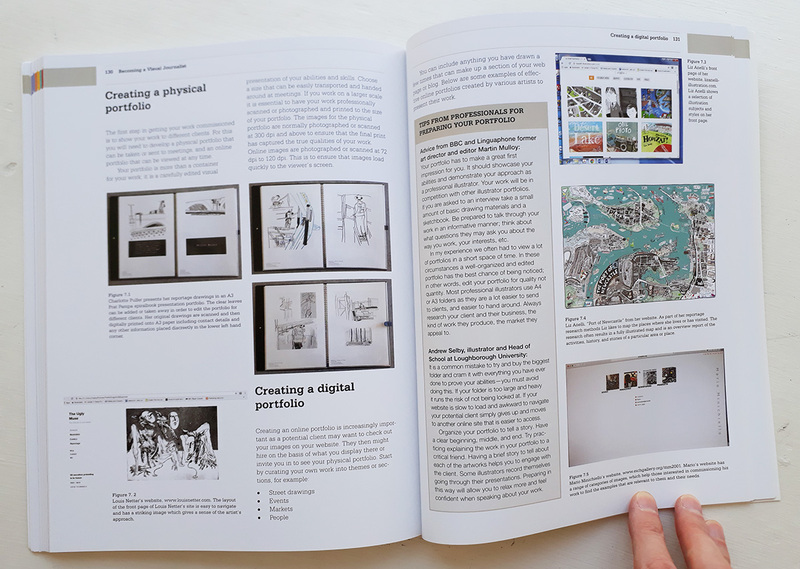 Interviews with a high calibre of artists offer first hand experience and advice, with the text recognising individual approaches and discussing skills alongside the positive aspects of experimentation (although Bo Soremsky points out that not every topic will be appropriate for reportage). 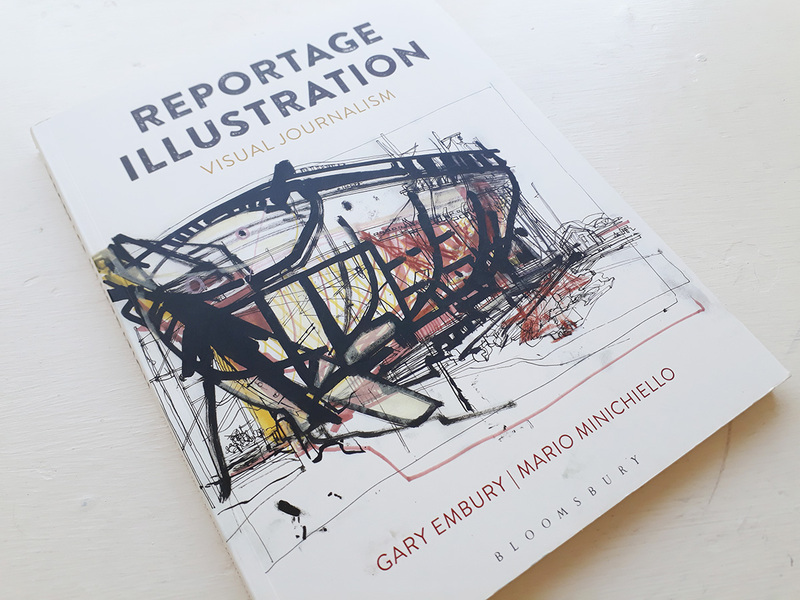 Authors Gary Embury and Mario Minichiello are practitioners and educators, with Embury the editor of the Reportager website, and they bring clear information and an enthusiasm for their subject which is infectious. You really want to get out there with a sketchbook in hand to start documenting. With a wide selection of visual approaches to reportage, there’s a great range of images to enjoy. From Anna Cattermole’s two-year record of shipbuilding to Anne Howeson’s dreamlike images of the vanishing buildings of London’s Kings Cross. Examining the images is revealing. Scale is an element of the compositions which often places the human aspect of the image into the context of its surroundings. 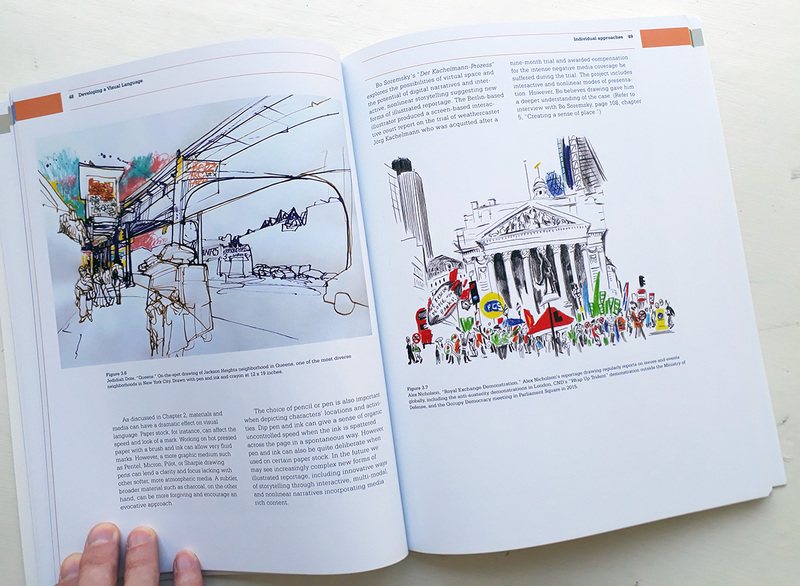 As in Alex Nicholson’s drawing of a demonstration outside the monumental buildings around Bank in London, or the intimate space occupied by Steve Wilkin’s commuters, drawn regularly on his daily travels to work. 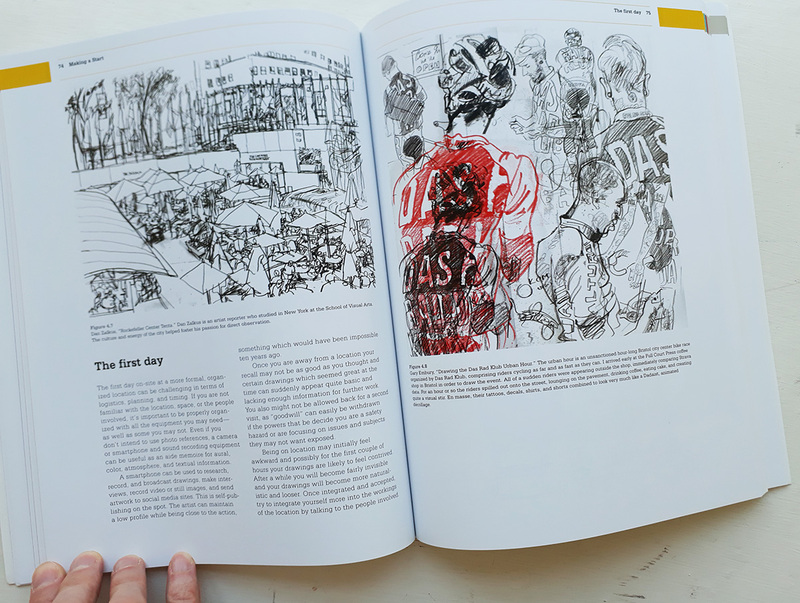 Louis Netter states in his Case Study ‘A good reportage drawing for me is an evocation of place and a granular moment of a human drama’, and many of those interviewed have considered views of what works for an effective reportage project. 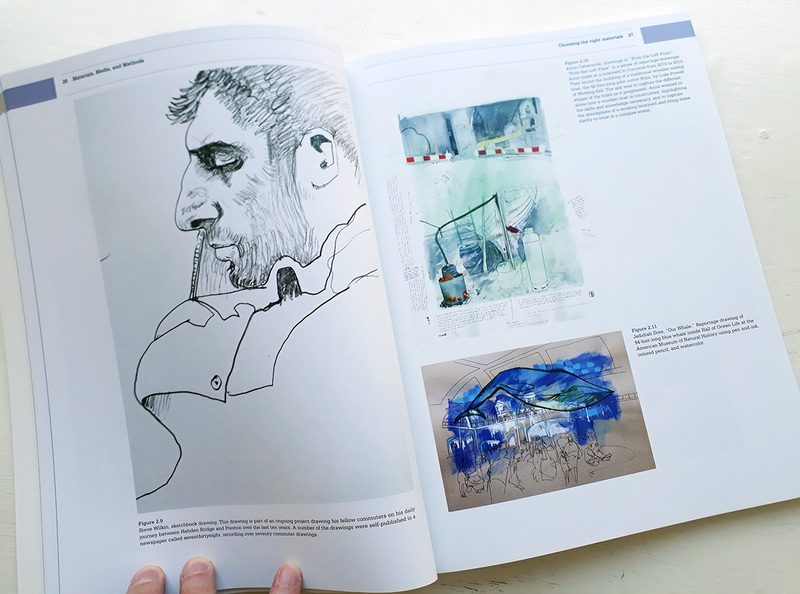 ‘Draw every day’, experiment with material’, ‘capture motion’ are some of the points emphasised though the book, with Jedidiah Dore commenting ‘Make mistakes and learn from them, but try not to beautify your drawings or erase for the sake of aesthetics. You are on location to capture information, it is primary research you are after’. The practicalities of access to areas of interest, budgets and planning are detailed, along with working with your subjects, creating a narrative and a checklist for developing a story being observed. ‘It’s one thing to be able to draw a location, building or landscape,’ say the authors, ‘but what makes a good reportage project are the narratives and stories told through human interaction’. 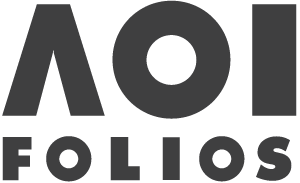 Materials can be varied for reportage, with the digital proving effective for many. 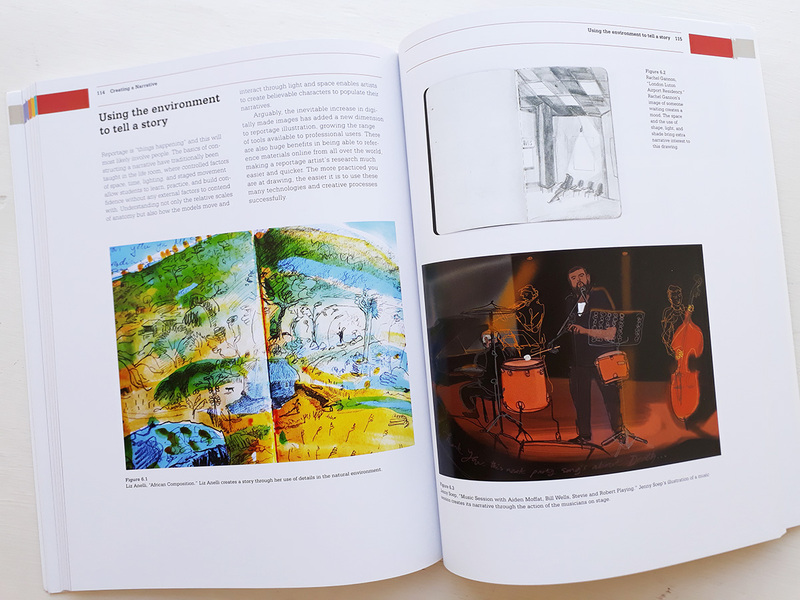 Jenny Soep often using a tablet to capture live music events, and Tim Vyner creating fascinating time lapse films of his drawings. And opportunities keep arising. Vyner gives a mature reflection of how reportage could develop and how technology could impact on the way visual journalism is recorded. As an introduction, but also an investigation with depth, Reportage Illustration achieves a broad overview. 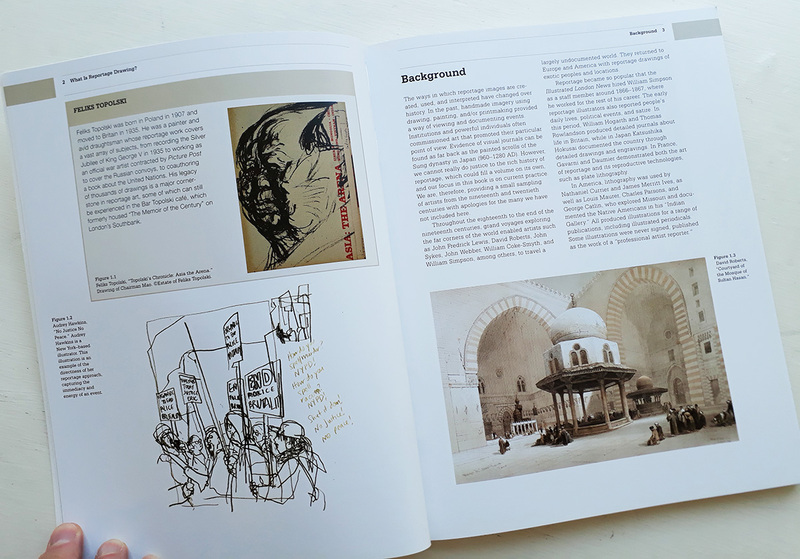 A few examples from beyond the USA and UK could have added more visual voices, but the book provides plenty of examples of riveting work and a strong argument for the power of illustration as a witness and recorder of events through first hand observation.